I cannot begin to tell you how excited I am about this piece of good news. I am writing this with a big grin on my face. A huge grin from ear to ear. I’m not one for brazen self-promotion but I’m telling you anyway. I am now a published cookbook photographer. This is bigger than having my blue crab land on the cover of a Florida magazine. Infinitely bigger. My good friend Steven Gdula’s new book, Gobba Gobba Hey, a Gob Cookbook, just came out and the gob photograph on its jacket was taken by yours truly. It looks pretty darn sharp, if I do say so myself. A gorgeous photograph to accompany an already gorgeous book. But hold your horses, I can hear some of you say. Gobba Gobba what? Gobs? What on earth are they? Steven Gdula is one of the pioneers of San Francisco’s street food movement and the brains behind the gobs of Gobba Gobba Hey, named in honor of the punk rock icon, the Ramones. A gob is a regional cake-like confection from Pennsylvania where Steven grew up. It is made of two moist, dense cake domes joined together by a sweet cream cheese filling. Gobs usually come in chocolate with a vanilla filling but Steven gives them a twist by using seasonal ingredients and unique flavor combinations. Orange, cardamom, and ginger with saffron filling. Matcha green tea with lemongrass and ginger filling. Vanilla with strawberry balsamic filling. Lemon poppy seed with blueberry filling. Be forewarned, his gobs are crack. Truly addicting. Steven debuted his ube gobs in a local street food event that celebrated Filipino cuisine in the spring of 2010. That was where I met Steven and had a taste of my very first gob. His coconut with ube filling is a sentimental favorite not only because of its Filipino flavors but because it reminds me of how a photograph I took and a blog post I wrote were repaid with kindness and friendship. “I love your work and I want you to photograph my book”. I can still remember the thrill in Steven’s voice when he broke the good news to me over the phone almost a year ago. The news came at the most opportune time when cameras kept crashing down. We all know that hard work and a little luck bring breaks but who knew Pennsylvanian cake sandwiches can bring them, too. 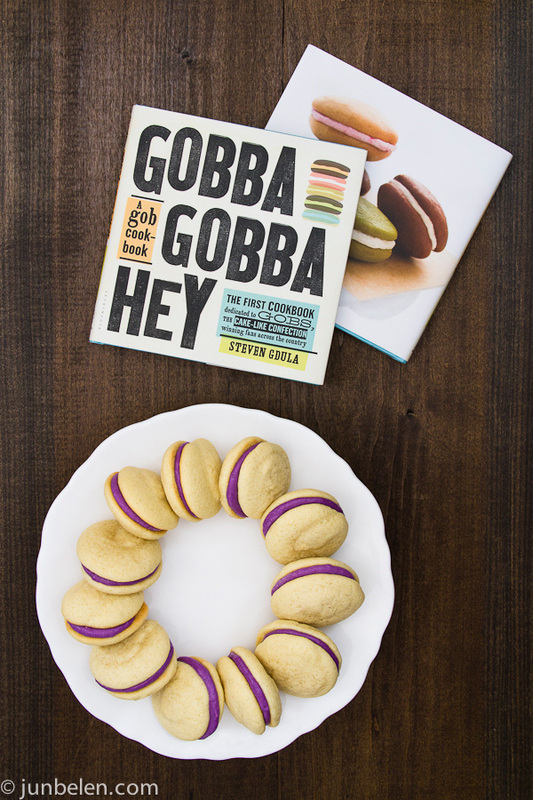 Gobba Gobba Hey, a Gob Cookbook is a collection of 52 recipes and stories that chronicle Steven’s first year of gobbing. 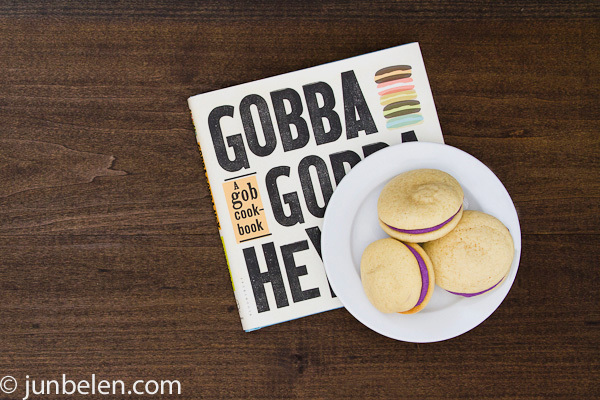 The first cookbook dedicated to gobs is now available in stores and online. Preheat the oven to 350 degrees F. Line three 8-by-13-inch cookie sheets with parchment paper. In a large bowl, sift together the flour, baking powder, baking soda, and salt. Whisk the dry ingredients until they’re evenly distributed. In another large bowl, cream the sugar and butter with a mixer on medium speed. Add the egg yolks to the creamed ingredients, and mix on medium. Add the egg whites, vanilla, and coconut extract, and mix on medium-high until the mixture looks like a dense pudding. Alternate adding the dry ingredients and the coconut milk to the egg mixture, mixing on medium speed after each addition. Then add the sour cream and mix well. Using a tablespoon or pastry bag, drop 1-1/2-inch rounds of batter. bake them approximately 8 minutes, or until the gob domes have risen. remove the gobs to a wire rack to cool. Defrost the ube according to the package instructions. Cut the defrosted ube into 1-inch cubes, preparing enough to measure 2 cups. Put the ube, sugar, lemon juice, and 1 cup of water in a saucepan. Bring the liquid to a boil. Reduce the heat and simmer, stirring occasionally to mash up the ube. When a paste starts to form, remove the pan from the heat and allow the mixture to cool. If the mixture becomes too thick, add more water, one tablespoon at a time. Add cooled ube mixture to a food processor and carefully puree it. If the mix becomes too starchy, add more water. Reserve the ube puree for the gob filling. Cream together the butter and cream cheese with a mixer on medium speed. Add the vanilla, lemon juice, and confectioners’ sugar, and mix on medium. Then add 1/2 cup of ube and beat until the mixture is fluffy; scrape the bowl with a spatula to reincorporate the ingredients if necessary. Taste and add another tablespoon of lemon juice if you like. If the filling looks like it needs more stability, add more ube. To frost the gobs, flip the baked gob domes over on a cookie sheet and match up pairs of similarly shaped dome. Add 1 tablespoon of filling to the flat side of an overturned dome, then place another dome on top, sandwich-style. Allow the gobs to fully set by refrigerating them on a baking sheet for at least 1 hour. Wrap the gobs in plastic wrap to prevent them from drying out. Wow! A very big and well-deserved congrats, Jun! Truthfully, your photos are so simple and gorgeous, it was only a matter of time. What a fun recipe, too. I love the fact that you seek out interesting (to me, at least) and traditional Filipino ingredients. Congrats again! Oh, wow! These treats are so PRETTY! You know how I love PURPLE, and PURPLE DESSERTS!!! Sounds Delicious. Congratulations on getting your photographs published. I am a big fan of French macaroons (although this is not the same), it has the same concept of filling in between 2 cookies. I love that he included the ube filling. I am not much of a baker but I will try this one for the holidays and spread some cheer. Congratulations Jun! Many hopes for a continued career in the field. As an old food writer, I know that the photographers always got paid better than the wordsmiths! Congratulations, Jun ! How wonderful for you! I am so thrilled that your photo made it to the cookbook’s cover. But of course, I have no doubt….it’s a “Jun Belen” photo! May many, many more wonderful things happen to you now and always, my friend ! Cheers!!!! Congratulations Jun. Well desserved! I am grinning that smile while reading your good news too OMG that smile of yours is infectioius haha! It’s been awhile since we bumped into each other. Glad to be here again. Take care! this is Big, I’m so happy for you!!!! you definitely deserve this kind of recognition! Such great news Jun!! This is tremendous. I just saw this book at Books,Inc. and it looks great!I’m happy that your talent is getting the recognition you deserve. Congrats Jun!! These are soooo cute. I also love ube, especially ube ice cream and ube jam from Baguio! titser sa photography class…your pictures are all gorgeous! Thank you so very much, Beth. Thank you! Definitely try the gobs for the holidays. The purple hue of the ube filling is just stunning. So festive. Oh, Nancy, thank you very much. You are too kind. Carole, thank you very much. I’m so excited that the book is finally out. It’s been almost a year and seeing my name and photograph on it was just too exciting! Congrats, Jun! Beautiful photos as always! Congratulations Jun! That’s such a coup for you! For a moment there, I thought it was French macarons (which would be a big coincidence since I’m on the hunt for good ones here in Manila hehe). Those gobs look delicious though. I’m a big fan of ube jam, and I can usually finish one bottle of it every time someone buys one for me in Baguio. Congratulations Jun! Your photos are always stunning. Now a photo credit for a beautiful cookbook – that is just fantastic. Those cookies look simply divine! Congrats Jun! Well deserved indeed for your photos are truly inspiring. people.” Congratulations, Jun and I wish you more success. Congratulations my friend!!! This book looks incredible and I have no doubt it is filled with fantastic recipes and your delightful photographs. Congrats, Jun! Your photos are brilliant, and these gobs look good! Congrats Jun. Much deserved accolades and don’t shy but that is what we so much love about you so much talent, so humble! Betty-Ann, thank you so much for all the support! I am very thankful. Thank you so much, Monika. So excited that the book is finally out! Thank you, Bianca! Love, love Good Shepherd in Baguio. Their strawberry and ube jams are so, so good! Arnold, thank you! We should get together sometime soon in Oakland! Lisa, thank you for the note here and in Facebook. So very excited about the book! Emilie, thank you so much for the note and for following the blog! Maraming salamat! Ray, maraming salamat. Your note made my day. Thank you, sir! Kat, thank you very much! Now that you pointed them out, the gobs do look like macarons. I’m a huge fan of Good Shepherd’s ube jam, too. Now I’m thinking of ube jam pan de sal sandwiches with a drizzle of condensed milk! Guaranteed sugar high! Hey Jun, I am really proud of you. This is much deserved – you are incredibly talented. Love the purple ube in those gobbas …. gorgeous color!!! Congratulations! So so deserved and this recipe looks absolutely gorrgeouusss Im tempted to make the gobs by themselves as im not sure i could get my mitts on some ube (have to say never even heard of it before! but sounds delish ) Lovely post and congrats again! Quite a nice blend of color. The ube made it look enticing, it looks inspired by Chinese delicacies. These look so good! I’ve made a couple varieties of whoopie pies before (a gob by any other name.. 😉 ) but I haven’t come across coconut before. Must make! 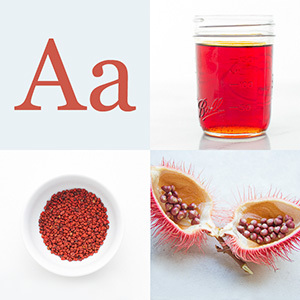 Congrats on becoming a published cookbook photographer, too! How exciting! Gotta love the name. And gotta love the beautiful color of that filling. Yum! CONGRATS!! That is a hugs accomplishment. Oh to photograph a book is a goal of mine too. OH MY GOD!!! How did I miss this post?!?! This huge Jun, so so so huge!! I’m so happy for you, and, after reading that pumpkin pie post, even happier to read how things have changed since then. You are incredibly talented, don’t ever forget that! How have I never heard of this until now. I’ve spent all this time and did not know about a gob? just when I was looking for a recipe using ube! this is awesome! thanks for sharing Jun!